Once upon a time there lived in Hawaii two brown dachshunds named Be and Bop. Be was a girl, Bop was a boy, and they were the children of Alula. Be and Bop loved Hawaii, and they loved Alula. However they did not love Adenoid. They lived with a boy named Adenoid, but he was mean and he was rude. He did not let them sleep in his bed at night. He did not care for them tenderly. He often called them scornful mocking names such as Weiner, Frankfurter, and Knockwurst. He fed them rarely, and never once did he sneak them tempting little tidbits from the table. He was an indifferent uncaring person, so they decided to leave him. So they did. They clambered down Adenoid’s stairway and ran away from his home. Be, Bop, and Alula were quite lazy dachshunds, so in truth they walked away. Actually, they strolled away. Very slowly, and with many pauses to sniff tree trunks, root under bushes, frolic on hillsides, and, from time to time, simply to sit side by side on cliff tops and gaze quietly at the deep blue sea. During the early afternoon they discovered a hillside they particularly liked. It was covered with soft grass, and thick hibiscus plants grew all about. There they sat side by side by side. They sat together for a long while, and chatted with one another in bark language. They loved to do that. They enjoyed one another’s company greatly. Their favorite activity (after eating, sleeping, and chewing on humans’ spare shoes) was to sit quietly together and chat. Their friendship with a cat named Quack, who had fallen deeply in love with a mouse named Meow. Quack and Meow were certain they could make their marriage work, and the two little dachshunds agreed. “After all,” said Bop. “All you need is love.” Be agreed: “That’s true. And don’t you adore seeing them stroll together, paw in paw, smiling from whisker to whisker?” Alula smiled at her children, and rubbed her jowls across their little heads. Be and Bop nodded. They knew their mother was the wise one in their family. They rose, stretched, shook their coats vigorously, and set out to seek their destiny. 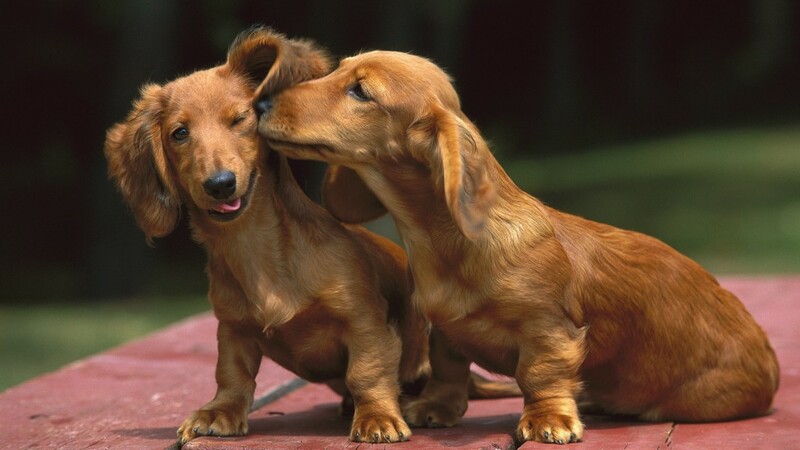 The dachshunds walked and walked until they found a girl they liked. Bop discovered her. He was chasing a butterfly named Stunning. Stunning led him into a park, down a pathway, across a green glade, over a bubbly brook, toward a vast banyan tree. Beneath the tree sat a lonely girl. A book lay on the ground beside her. The girl had been reading. But she set her book aside because she wanted to find love and adventure in her own life, not borrow it briefly from invented people’s storybook world. Please will you send me, who love and yearn for you, hope and delight? And evermore, for all my days and all my nights? The lonely longing girl opened her eyes. Even though it still was daylight, she felt sure she saw many star twinkles shining gently through the sun’s strong gleam and glare. Just then she felt a soft wet muzzle nuzzle her ankle once, twice, and once more again. She looked down, gasped, and smiled with the delight for which she had prayed. Bop barked, and plopped himself in her lap. She felt her soul open wide, and she hugged him to her heart. The girl looked upward with tears flowing freely from her eyes, and she thanked the stars again and again. They twinkled gently upon her. Bop thanked the stars too. Then he hallooed with the long lingering reverberating yodel that all dachshunds can create whenever they want to. Alula and Be dashed toward Bop. Dachshunds can ran very swiftly when they please. They dashed to the park, down the pathway, across the green glade, over the bubbly brook, toward the vast banyan tree. The girl kneeled on the leaf-strewn ground and held out her arms. Alula and Be hurtled themselves onto her lap. They rolled and tumbled there with Bop, and licked the tears of joy from the happy girl’s shining face. The girl liked the dachshunds so much. The dachshunds liked her, too. The girl’s name was Philomena Periwinkle, but that was way too hard for them to pronounce so they decided to call her Winkle and the girl agreed. Winkle took the dachshunds home straightaway. After all, night soon would descend upon the parkland. Following an interesting conversation and much adorable behavior from Be, Bop, and Alula, her parents agreed they should make room for three dogs in their hearts and in their home. The stars rose in the sky and shone ever so brightly that night over all the Hawaiian islands and onto Philomena Periwinkle’s rollicking household. It remained dark over Adenoid’s unfriendly dwelling. Everyone dined heartily that evening, and every evening from then onward. Every morning too, and throughout every afternoon also. Dachshunds love to eat, and Winkle loved to feed them. Secretly so did Winkle’s Mom and Dad. Her grandparents as well. There lived lots and lots of love in the Periwinkle home. Be and Bop always slept in Winkle’s bed. Alula liked to curl up on a soft woven woolen rug below. Before they slept Be and Bop frequently flopped. Many times every evening as they settled in they flopped on their sides. They loved to do that together, side by side, head to head, back to back, snout to snout. When Be wanted to flop, Bop always agreed. When Bop wanted to flop, Be agreed. They called that Cofloperating. As they flopped they liked to pump their legs as though they were running. One night Be suggested they should kick their legs backward instead of forward. Bop thought that was a wonderful idea. They tried and tried, but they could not do it. They only could kick their legs forward. Bop started to cry. But then he had a great idea. Alula rose from her carpet to ask what Be and Bop what on earth they were doing? Ever afterward as she and children wandered on their daily journeys she told all the other Moms about her children’s magic skill. From that evening onward she pranced proudly wherever she walked or ran. Be, Bop, and Alula did not miss that horrid Adenoid at all. They did not miss him even one little bit. There is much more to this story. In fact, it has just begun. In future holiday seasons, we need to tell you how very happy this dachshund and human family become. We also need to tell you what became of Toadstool and Thaddeus, Pomegranate, and the marriage of Quack and Meow. Plus we need to introduce you to a large grey rabbit named Ronald Romance and a narwhale called Nomenclature. This is but one of the reasons why there ought to be more, many more, far more festivals and holidays during the school year than is currently the practice.